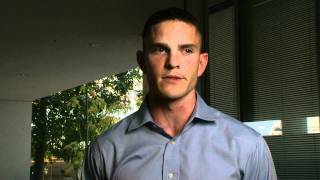 Interested in knowing what our students, faculty, and alumni think about Pardee RAND Graduate School? Our site presents lots of quotes and videos, which are shared here — with many others — so you can gain a first-person perspective on Pardee RAND. I believe that smart creation and implementation of public policies is an absolutely vital component of continued economic development and political stability in the U.S. and globally. I’m intrigued by what I see as old and emerging policy issues related to water supply, aging water infrastructure, and long-term risk mitigation regarding climate change. I want to position myself through the development of a policy analysis skill set to be at the forefront of combating these issues in the future, so I chose to continue my education at Pardee RAND. RAND has always been at the forefront of policy analysis and methodology innovation, so the opportunity to participate in ongoing RAND projects is an unrivalled experience compared to other graduate school opportunities. I was attracted to Pardee RAND Graduate School by the doctoral program’s unique balance of coursework and on-the-job training. I learned new skills in the classroom and had the opportunity to apply them on RAND research projects. This combination of academic study and direct application enabled me to hone research skills and build a strong portfolio of work. On-the-job training also exposed me to a wide range of research subjects and many different project teams. As a graduate from Pardee RAND Graduate School, I will be able draw on these rich experiences and rigorous research skills as I move forward in my career. There are many things that I love about being at Pardee RAND: the academic and intellectual rigor, the opportunities to explore diverse research interests, immersion in the RAND culture of conducting objective and high-quality multidisciplinary research, the diverse experiences and backgrounds of colleagues, and, of course, the sunny and beautiful Los Angeles weather. Most importantly, I am excited to be acquiring cutting edge analytic skills that help me tackle complex challenges facing healthcare access in sub-Saharan Africa. One overarching policy question that continues to motivate me is: How can lawmakers ensure that all students, regardless of their background, have access to a high quality Pre-K – 12 education? This research question lends itself to several specific lines of inquiry within and outside of education policy research. Kids are not educated in a vacuum. To provide all children with equal educational opportunities requires considering the intersection between education and related policy areas, including criminal justice, housing and health. I chose Pardee RAND for the unique opportunity to approach these complex and (naturally) interdisciplinary problems comprehensively and from a policy-oriented perspective. What I enjoy most about Pardee RAND is the exposure to quality research and the opportunity to work alongside professionals in the field. As someone coming from a mathematics background, I decided to study policy analysis in order to broaden my understanding of research methodologies that will allow me to construct solutions to issues that affect us today. In this program, I aspire to make important contributions to local and national issues facing our education system today. I am most passionate about improving student outcomes and increasing participation of minority students in STEM disciplines. Pardee RAND is unique in that our program transforms students into scholar-practitioners who learn to produce positive social change for individuals, families, and entire populations around the world. 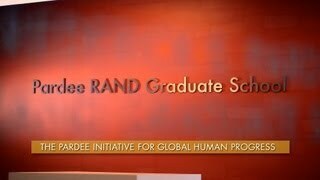 Pardee RAND, like RAND, supports global engagement in research and policy analysis. Taking a broad international view to policy analysis opens our fellows to new paradigms of thinking which in turn positions them to make important contributions to global change. I have worked with students at different stages of the doctoral program on projects such as designing poverty alleviation programs, means-testing mechanisms to target the poor, randomized control trials and quasi-experiments, using program evaluation techniques to understand the impact of social programs on the wellbeing of the population, and designing, programming, and implementing complex surveys in the field. I am impressed by Pardee RAND students' high-quality research skills from the first year of the doctoral program—an approach that is fostered throughout Pardee RAND and RAND in general. RAND is a candy store of opportunities to affect public policy and the ideas that determine it while simultaneously working in an intellectually exciting not-for-profit organization that has a special working relationship with our government sponsors. Pardee RAND students are intimately involved in real public policy research and often make substantial contributions to their projects. The curriculum and atmosphere are strongly interdisciplinary and the rigorous and quantitative aspects of that curriculum are taken more seriously than at some other roughly comparable schools. Also, while some of the courses are necessarily rather rigorous and classical, a number of courses are more like seminars — emphasizing discussion, case histories, and critical thinking rather than book learning. This is appropriate for students with prior M.S.-level education and, often, a good deal of life experience. It is especially appropriate in a think-tank atmosphere. Pardee RAND offers a unique opportunity for graduate students to gain hands-on experience in policy-relevant research while at the same time learning about research methods and policy analysis in small and engaging classes. At Pardee RAND, the doctoral experience is integrated into the types of work settings students are likely to face after graduation. Further, Pardee RAND students' opportunities for mentoring from RAND researchers is enhanced by the extensive on-the-job training required of all students, which often offer options for dissertation work. I have been very impressed with the Pardee RAND students who I have worked with, in particular their analytic competence and intellectual curiosity. They play an important role in helping RAND carry out its mission of improving policy and decision-making through research and analysis. Because my courses are required, I face most of the 25 or so first year students in each cohort. After explaining some new method or insight, I try to have them learn it by working in small groups on a simple problem briefly and then discussing their findings. The problems often involve common sense, and even politics. This works well because the range of experience and attitudes in the class leads us all in unexpected directions. In addition to men, women, young and not so young, Americans and foreigners, we have social scientists and engineers, doctors and pilots, tender hearts and realists. Nobody gets to preach to their own choir. Because my tools are mathematical at heart, the range of mathematical sophistication is a teaching challenge. All the students have mathematical aptitude, but their math skills vary depending on the schools and countries they come from. I keep the in-class examples simple, leaving the complications to problem sets. I mainly try to get across attitudes—skepticism about numbers that are given to you, but belief in the value of 'doing the math'. In making any serious decision, take enough time to think about the major consequences and do a few simple calculations. I give references to advanced material for the better-prepared students, but I think they mainly get read if and when needed on a later project. At Pardee RAND and RAND "multidisciplinary" is more than just a buzzword. Pardee RAND fellows and RAND researchers work together in multidisciplinary teams on cutting-edge policy questions as a matter of course. 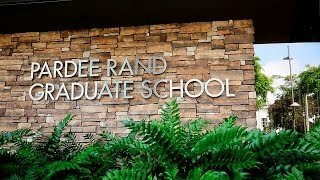 This is what makes Pardee RAND a unique place to get a doctorate in and a truly stimulating place in which to teach. I get to teach to fellows with diverse backgrounds unified by a sense of rigor in analysis. And in the same week I could be discussing with Pardee RAND fellows a wide variety of dissertation topics relevant to far-flung regions—social ties in Indian entrepreneurship, nutrition and food security among HIV patients in Latin America, agricultural productivity in China, tradable water rights in India, corporate governance in Southeast Asia, mobile telephones and grain traders in Ethiopia, rehabilitation of ex-combatants in Uganda, and child labor in Tanzania. This is a place where policy research questions drive the agenda rather than the narrow confines of specific disciplines or methodologies. Cross-cutting research does not get more real or exciting than this! Pardee RAND provides a truly unique graduate school experience. Unlike other Ph.D. programs in policy analysis, this one provides the added practical experience of on-the-job (OJT) training, making it stand out from the competition. As part of the tuition reimbursement plan, students are required to work for pay as team-members on 'real-world' research projects with RAND research staff. This benefit is not to be understated because future policy analysts with Pardee RAND backbones will be poised to make a difference! I've had ample opportunity to work with these bright and knowledgeable students on my research projects. They have contributed as key members of my research teams on all aspects of the work (recruitment, data collection, analysis, and writing). These studies involve complicated randomized research designs that take place in 'real world' clinical settings with people who are faced with serious problems including depression, post-traumatic stress disorder, substance abuse, and poverty. Students learn quickly how to manage projects and maintain the integrity of the research design despite practical challenges associated with these complex settings and populations. Yilmaz is chairman of ARGE A.S., a management consulting firm in Istanbul, Turkey. He is also the chairman of Rothschild Investment Bank in Turkey. Pardee RAND contributed very significantly to my personal and career development. Particularly, the broad perspective and vision that I gained through my studies at Pardee RAND helped me bring about significant change at the various institutions I have worked for. The powerful combination of rigorous coursework and on-the-job training was very valuable in understanding the importance of both a sound theoretical basis and the practical implementation issues. For example, when I headed the Privatization Program in Turkey, we focused not only on the transactions, but also on education of the public, development of a local investment banking community, and the stock exchange. These actions all helped the liberalization of the Turkish economy. Also, when I headed the Turkish Quality Association, we have started the National Quality Movement to improve the management quality at the private and public sector institutions, and NGOs. As a result, Turkey has been one of the leading countries in Europe in winning European Quality Awards and in deploying quality management techniques to the public sector. I am currently the Chairman of ARGE Consulting, the only local firm among the top three consultancies in the country. ARGE has recently been a finalist for the 'Shaping the Future' award to be given at the EU Parliament for corporate social responsibility. It is ARGE's policy to encourage all its employees to donate one day a week for NGO activities. This policy has helped us contribute to the development of civil society for Turkey's transition from representative democracy to participatory democracy. In short, I learned a great deal, both intellectually and practically during my studies at Pardee RAND. I would like to express my appreciation for all those who have contributed to developing such a fine institution. Charles is a professor of SCCP Clinical Pharmacy and Outcome at South Carolina College of Pharmacy. His pathbreaking dissertation on "Quality of Care with Relation to AIDS and Oncology" spawned much subsequent work. Pardee RAND was truly one of the most meaningful experiences of my career, and I look back fondly on it. My dissertation has been evaluated in subsequent studies funded by the Veterans Administration, the American Cancer Society, and the National Institutes of Health. I have received eight R01 equivalent grants that directly build on my dissertation, and I have published more than 50 articles on the work. Janice is an assistant professor and director of policy programs at the George Washington University Medical School in Washington, D.C.
Pardee RAND offered a unique environment to gain a broader understanding of critical issues related to policy. The assets there are tremendous. You are surrounded by world experts from a variety of disciplines ranging from statistics to economics to defense. This was particularly important for me as a physician where my prior background was somewhat restricted to clinical medicine. I was able to broaden my interests significantly and studied subjects about which I normally would not have learned. I also enjoyed the benefits of being surrounded by fellow Pardee RAND students from diverse professional backgrounds coming from all over the globe. This creates a wonderful positive energy and is highly conducive for further learning and creative approaches/solutions to previously insurmountable problems. Annie is a post-doctoral fellow at Harvard University in the Belfer Center for Science and International Affairs, working on their Cyber Security Project. At Pardee RAND, I got an education I could not get anywhere else. The curriculum was intense and interdisciplinary, difficult but incredibly rewarding. I was encouraged to think both creatively and practically; not only to solve problems, but to develop solutions that can be implemented in a real-world context. Because my classmates came from a wide variety of backgrounds and disciplines, I feel like I learned something new every time I talked to them. I came to Pardee RAND right after law school and was worried that I would miss out on opportunities to apply my education to real-world problems. However, Pardee RAND treats practical work as an integral part of the curriculum, which enabled me to tailor my education to my policy interests and previous experience. Not only did the practical requirements allow me to practice and apply the analytical skills learned in class, I was also able to work on issues I care deeply about. Since RAND works in so many different policy areas, I was able to explore a wide variety of research interests, from medical marijuana to electronic searches to public nuisance law. Because I learned practical skills while still a student, rather than during my first few years on the job, I know that my education fully prepared me to succeed in my future career. Richard is chief accountability and strategy officer with Santa Fe Public Schools. Before coming to Pardee RAND I worked for the Los Angeles Unified School District in a variety of capacities, generally in the fields of legislation and education policy analysis. I also taught physics and chemistry in LAUSD at my alma mater, Sylmar High Math Science Technology Magnet, for three years. 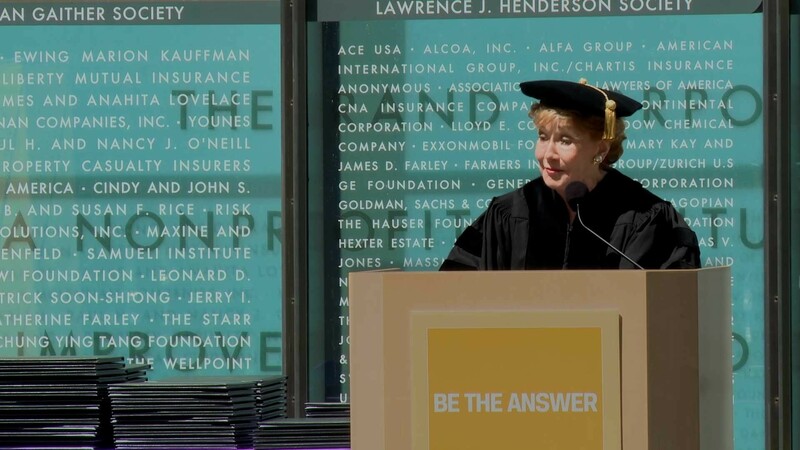 My first and foremost reason to come to Pardee RAND was to make a difference in the lives of children, most specifically in the field of education. As a post prelims student, I was able to work on projects in many areas of my interest. The most enlightening was a project where we studied the health related behaviors of homeless youth. It involved going on the streets and learning about a lifestyle which I had not been previously exposed to. The process, along with my experience teaching similar youth, has both dispelled my misconceptions and propelled me along a path of greater knowledge, understanding, and empathy. It is difficult to shine a spotlight on just one positive area of my Pardee RAND experience, as there were so many. However, two areas stand out: first, there is incredible opportunity for a self-starting student. For me, this meant publications and key roles in data analysis. The second outstanding area is that an incredible diversity of research is done there. This meant that, no matter what I wanted to know, I could find someone that was intelligent and knowledgeable on that subject. The Pardee RAND Graduate School experience is a sheer treat for the mind. Arthur is president of American Enterprise Institute (AEI). Even during all my years in music, I was never as happy as I was at RAND. Often I worked on things that I had no particular background in, but in which I found I had an interest — and as long as I could add value to a project, RAND gave me the chance to succeed. I worked on an aircraft survivability project, and it turned out to be fascinating: I learned every day in the project team, mixing my own abilities using quantitative tools with the topic-specific knowledge of the others. Where else could that happen, but in a community of scholars, where curiosity and imagination thrive in amazing and unsuspected ways. Tom is CEO of A&N Technical Services, Inc., a national consulting firm. Graduate school is usually the place one goes to learn more and more about less and less. Pardee RAND let me get beyond the blinders of any one discipline. It also taught me broadly applicable lessons — how to communicate complex ideas, how to market oneself, how to work with researchers. Jennifer is a strategic initiatives manager for Wellpoint. The OJT component of the curriculum differentiated Pardee RAND from the other graduate programs I was considering. I worked on quality of care projects within RAND Health for OJT and my experience was extremely positive. The first year of my OJT was extremely flexible so that I was able to focus on my course work. Over time, my responsibilities on my projects increased and become more interesting. Through my OJT, I had the opportunity to work with public and private sector clients, be an active member of project teams, attend meetings and conferences, and to contribute to the writing of proposals and RAND publications. My OJT experience provided valuable professional opportunities and mentoring to complement the Pardee RAND academic curriculum. Diana is a senior research analyst at the Corporation for National and Community Service. Prior to coming to Pardee RAND, I completed a master's degree in public policy at University of California, Berkeley. I also served in the AmeriCorps National Civilian Community Corps program for two years, working on a variety of direct service projects, including building houses with Habitat for Humanity, tutoring in schools, building trails in state parks, and doing environmental restoration. I came to Pardee RAND to gain rigorous methodological skills and applied research experience. I wanted to learn about policy analysis in more depth than I had in my master's program and to be in a work environment where I could simultaneously apply the skills I was learning in the classroom. Pardee RAND fit the bill! One of the great strengths of Pardee RAND is that the methods you learn have applicability across a wide range of policy areas. My OJT projects included studying governance options for the Los Angeles Unified School District, evaluating a national non-profit organization that trains school principals in new ways, assessing the use of formative and interim assessment systems in California school districts, and studying the policy consequences of political polarization. My dissertation work used both quantitative and qualitative methods to evaluate the long-term impacts of AmeriCorps service on participants. Pardee RAND gave me the opportunity to take initiative and leadership in ways that I would not have been able to do at any other school. In my first three years there I served as the co-Principal Investigator on a student-initiated knowledge management project, led the development and writing of a RAND publication, interacted with fascinating members of the Pardee RAND Board of Governors, provided feedback on the direction of the school, and worked with another student to develop the curriculum for a new microeconomics bootcamp class. These experiences were amazing learning opportunities for me, both professionally and personally. I also enjoyed interacting with a fun, diverse group of classmates from around the world and engaging with researchers in a deep and meaningful way through small classes and project work. Stephen is an assistant professor of economics for the United States Military Academy at West Point. I am currently an officer in the United States Army and have served for over 20 years. Immediately prior to my arrival at Pardee RAND, I was a battalion commander in the 3rd Infantry Division, responsible for reconstruction operations in Baghdad, Iraq. I selected Pardee RAND for my Ph.D. program because it offered the best combination of tools and methods to prepare me for the future. Pardee RAND has a program renowned for its analytical rigor, yet rather than espousing a theoretical approach to analysis, Pardee RAND teaches and reinforces, through real project work, a hands-on practical approach to policy development and analysis. This Pardee RAND method results in mentored development and ultimately the ability to plan, develop, and execute research and analysis projects on your own. The most poignant experience for me at Pardee RAND was the relationships I made with researchers. The collegial nature of interaction between students and researchers is superb. I was able to parlay my Army and Iraq deployment experience into multiple opportunities to contribute to projects including coauthoring three published papers. My dissertation work explored knowledge management and the use of "push" or "pull" technology to transfer knowledge most efficiently. The research was conducted in support of a RAND research project on an Army knowledge repository. In conjunction with this project, we put into practice many of the skills we learned in the fundamental research methods class. We developed web and paper surveys. We pilot-tested the surveys. We developed a codebook with 700 unique codes and coded nearly 15,000 responses. We developed a training handbook from the results of this coding. We conducted quasi-experiments by using Army units as treatment (received training handbook) and control groups whose performance was evaluated at the National Training Center. We conducted analysis of the results to provide the client feedback on the value of this "push" knowledge transfer tool. The bottom line is that I feel like I learned and then applied an incredible number of fundamental research methods that have provided me the breadth and depth necessary to tackle any opportunity, whether in academia, government, or private industry. Pardee RAND provided me the tools and the opportunities to learn and reinforce the skills necessary for success — I could not have made a better choice. Angela is an associate professor of public policy at Pepperdine University. Before arriving at Pardee RAND I already had seven years of microeconomics coursework behind me from previous degrees. I thought I had paid my dues to the study of microeconomics. Looking back, it is clear to me that my previous economics background had provided me with the skills to be a good theoretician but not with the hands-on skills I needed to be a good analyst or practicing economist. Pardee RAND classes take you beyond the theory. We were encouraged to experiment with independent modeling, to explore extensions of and alternatives to the economic theory we learned. I was so excited when I realized that I could take the models that had been taught to me over so many years and apply them in a meaningful manner. Other universities tend to present microeconomics as a set of abstract models which, at best, are applied to meaningless textbook scenarios. The applications given to us at Pardee RAND made me realize what a powerful analytic tool microeconomics can be in studying real policy problems. Anne is a managing director at the University of Copenhagen. She was previously the team leader for the World Bank on health projects in Tunisia and the West Bank and Gaza (WBG). This means she did everything from policy dialogues with the countries' leaders to supervising the implementation of the projects. What's clear to me now, so many years after I completed my Ph.D. from Pardee RAND, is what a good quality education I got. In particular, the analytical skills and substantive knowledge in the area of health policy have served me extremely well and are the main reasons for the success I have had in my career so far. 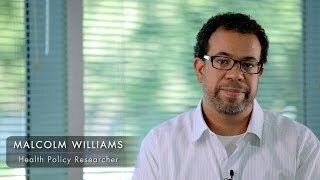 I always appreciated the personal attention that Pardee RAND students got from both faculty and researchers at RAND, but it wasn't until after I became an assistant professor at the Johns Hopkins School of Public Health that I realized how truly special it was, given the incredible workload that professors and researchers face. 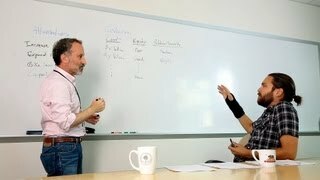 An additional aspect of Pardee RAND that has turned out to be really useful was the tremendous focus on communication skills, both verbally and in writing. I would venture to say that it is as important to be able to communicate your ideas as it is to have them. Often policy research or advice goes unused because of the way it is presented. Being able to communicate clearly has been an enormously important skill for me. I benefited extensively from my on-the-job training, not only in terms of technical skills but also in terms of managing a project, dealing with rejection, and in general learning how to become a professional. David is an associate mathematician at RAND. After spending years trying to decide between graduate programs in everything ranging from math to gender studies to systems biology, looking for a topic that was worth working on for years to the exclusion of everything else, I discovered a phenomenal loophole at RAND. Here, I had the opportunity to get a doctorate in public policy while tackling other interesting issues, building up years of very real work experience and expertise in multiple disciplines alongside the dissertation. As a student I worked to model the greenhouse gas emissions associated with production of biofuels, helped a water agency in northern California with long-range planning in the face of uncertainty about climate change and future economic growth, evaluated the economic risk from hurricane flooding in coastal Louisiana and the effectiveness of structural and nonstructural mitigation strategies, and more. Pardee RAND is a unique environment where students have more opportunities than time, and many of those opportunities involve engaging with world-class thinkers and policy makers at the highest levels of governance. In the flowery language of recruiting literature, many schools emphasize their mission to produce future leaders who will make an impact on their community and other lofty, hard-to-quantify goals. Pardee RAND is one of the only places where reaching that standard is practically unavoidable, because it will happen before you've even graduated. Teresa is a senior analyst in research and evaluation at The Broad Foundation. I had a big "Eureka!" 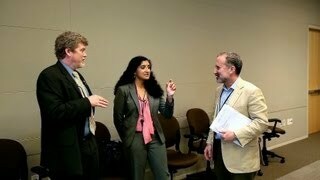 moment when I found out about the Pardee RAND Graduate School. I was looking for a program that was more technically rigorous but practical. I was also looking for a place where I could do actual policy work with real professionals, where I would be treated not as a student but as a policy analyst. Pardee RAND is all these. It teaches policy analysis using a lot of technical rigor but outside the sanitized environment of academia, in an institution that enjoys the respect of academia without being ivory-towerish. RAND is a fascinating playground for the practical intellectual. It has people from different disciplines and from different ideological persuasions. In its halls walk the most conservative Republicans and the most liberal Democrats, but who all share the passion to make the world a better place. With a lot of naturalness, RAND simply teaches what it does best. More importantly, I can honestly say that the professors and researchers at RAND are very supportive to students. I did not encounter a professor who did not care. And students in the program do not compete with but instead support each other. The Pardee RAND Graduate School is certainly technically rigorous, but in the end it is a family. Steve is the Chief of Joint Targeting Plans and Doctrine for the U.S. Air Force. The Pardee RAND Graduate School offers a fantastic program for individuals who want to pursue interests requiring analysis of complex subjects. From macro-level efforts to correctly comprehend and frame issues to micro-level analysis of the dynamics within those issues, Pardee RAND prepares its graduates to tackle a wide range of policies. The school's three-pronged approach is especially attractive. First, the program's core classes create a solid bedrock of quantitative skills and understanding that is useful in any analytical endeavor. Next, the program encourages students to pursue their own specific policy interests through electives, on-the-job training (OJT), and dissertation research. Pardee RAND students thus develop specific policy knowledge that is demonstrably making an impact in the world. Mentorship by RAND Corporation analysts through OJT round out the Pardee RAND experience-working with intelligent and creative peers on a daily basis is an educational experience all its own. I can think of no better program to support my own career requirements and research interests. Have no doubt—Pardee RAND is a challenging program, but the rewards are enormous. Christopher Lau is manager of industry analytics at Genentech. After working in both the Healthcare and Energy industries, I came to Pardee RAND because of the breadth and depth of the opportunities that the program offers. I can confidently say that the experience thus far has met my expectations. I found that the coursework leverages the analytic framework from several academic disciplines, while the project work offered me the chance to engage in a wide variety of public policy issues. In fact, I would say one of the most challenging aspects of student life was learning to focus one's intellectual curiosity into one to two policy areas of interest. Although a high level of intellect is a requisite characteristic of candidates for any graduate program, I would argue that Pardee RAND is further distinguished by the level of professionalism and motivation it demands. The fact is clearly manifest in the composition of the student body. When I arrived at Pardee RAND, I was excited to meet individuals who shared a similar desire to improve public policy, as well as a diverse set of experiences that complemented my own. I believe that the pool of Pardee RAND students represents one of the greatest strengths of the program, and has contributed to my overall learning experience during my time at Pardee RAND. Alessandro is in Brussels working as a policy officer in the Financial Stability Unit for the European Commission, Directorate General for Internal Market and Services. I loved being at Pardee RAND for the many opportunities of academic and professional growth it offered through my involvement in RAND research. RAND researchers are great mentors to Pardee RAND students, working in a team is very enriching, and the kind of research that RAND does is always at the forefront of policy. Being from Italy, it was important for me to be able to continue studying European policy problems thanks to the personal interests of some researchers and the ties between Pardee RAND and RAND Europe, but I also had the unique opportunity of enlarging my portfolio with projects based in Latin America, the Middle East, and of course the United States. The substantial variety of topics that I had a chance to study was also an invaluable source of motivation in my daily work. As a student I have worked on projects in labor, health, education, development, and military manpower. Public and private stakeholders turn to RAND with high expectations to find solutions to policy problems. At Pardee RAND, I received solid training in empirical methods and had the opportunity to apply it and further develop it in the ongoing challenge to fulfill those expectations and make a difference. Nelly is a Steven M. Teutsch Prevention Effectiveness Fellow at the Centers for Disease Control and Prevention in Atlanta. When working in social development analysis in Mexico I realized how important it is to find not theoretical, but practical and effective solutions, just as RAND does. I chose Pardee RAND because I was looking for a graduate program that would give me the empirical tools for solving real-life problems and let me take my skills to the next level. At Pardee RAND and RAND I got an amazing combination of coursework and research on projects with an interdisciplinary view that allowed me to assess problems from a wider, more complete, and practical perspective. At RAND I found a large variety of researchers and projects around the world. I widened my research horizon and collaborated on projects about aging, pensions, education, health, and cash transfer programs in Asia and Latin America. Through OJT my skills increased not only technically, but also through interaction with our clients, who ranged from academic researchers to foreign governments. Pardee RAND gave me the opportunity to pursue my research interests in the short and the long term. Moreover, all students here have diverse and astonishing backgrounds that contribute to the richness of the program and I learned so much from them. Christopher is a manager at Risk Management Solutions. I am originally from Canada, was raised in New Jersey, and was a college student at Emory University, majoring in applied physics and economics, before attending Pardee RAND. The main reason I chose Pardee RAND was because it was a place where I could further my education while gaining valuable work experience. The analytical nature of Pardee RAND was attractive to me; I didn't want to be stuck in an ivory tower environment but at the same time I wanted to be somewhere where rigorous analysis was used to help address important problems. The Pardee RAND program was also attractive because of the freedom it provided to explore different topic areas and try out new ideas while at the same time providing avenues to procure funding to analyze key issues in more depth. There were three highlights to my Pardee RAND experience. The first highlight was the coursework. For the first two years at Pardee RAND I was deeply involved in learning a number of different subjects at a level that I could not have comprehended before coming to Pardee RAND. Overall I found the coursework interesting, challenging, and most importantly found many of the techniques and tools useful both in my OJT and in job interviews. The second highlight was the OJT; I had the fortunate opportunity to work on a project where I was able to attend meetings with the research sponsor regularly and thereby see the policy process from many different angles. It was a great experience to go from implementing a large simulation model one day to sitting in a room with a policymaker the next and discussing the implications of different assumptions and results. Finally, a key highlight of my time at Pardee RAND was the students. Each student brings a unique perspective and background and it was a great experience getting to know everyone and struggling together to solve problems. Kartika is a UCLA/RAND Postdoctoral Scholar at the University of California, Los Angeles. I came to Pardee RAND after finishing an M.A. in development economics and international affairs at the Fletcher School at Tufts University. I also spent several years leading non-profit health and education programs for youth in Boston. Pardee RAND's close connection to RAND was a critical factor in my choice of a Ph.D. program. RAND excels in applied policy research, which is exactly the kind of career I am interested in. The education at Pardee RAND combines the tools and methods needed to conduct rigorous, policy-relevant research with practical experience actually conducting this research. We worked as members of RAND research teams on projects that have real clients. This was an exciting way to learn the craft of research and build strong relationships with some of the best minds in the field. I chose RAND because of its focus on methods and applied research, as well as the flexibility to work across disciplines to answer important policy questions. Plus RAND is a gold mine of stellar, cutting edge work in health policy. My work spanned several areas of health policy, from economic evaluation of health services or interventions in the US health care system, to community-based participatory research on HIV/AIDS issues in Los Angeles. I analyzed the social costs and benefits of reducing population-level sodium consumption in the US. I also collaborated with the UN World Food Program in Latin America to help develop and evaluate pilot programs that address the relationship between food insecurity and HIV/AIDS. 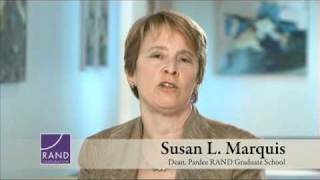 The highlight of being at Pardee RAND was working as an integral member of RAND research projects. Project work showed me that the ideal conditions for research rarely exist, whether because of constraints on data, funding, or time. Thus, research actually becomes a creative process of problem-solving under limited resources, where the skills of communication, "outside the box" thinking, and collaboration become ingredients of excellence. As a student, this was a highly valuable and stimulating lesson to learn early in my career. In addition, I found researchers at RAND highly accessible and open. Although we were students, the relationship was more akin to being colleagues. Larry is a vice dean for faculty affairs at the Rossier School of Education at the University of Southern California. Pardee RAND provided me with a set of analysis skills, a deep understanding of policy and how to turn research into useful policy findings, and most importantly taught me how to work with teams of researchers, rather than conducting individual research projects. Samantha is co-chair of the National Commission for Review of Research and Development Programs of the United States Intelligence Community. My Pardee RAND education has been invaluable for my career. The skill set I learned at Pardee RAND has enabled me to provide well-reasoned, timely, and concise policy analysis for the second highest elected official in the country. Across a large number of foreign and defense policies, I am able to use the qualitative and quantitative methods taught to me at RAND to assess the costs and benefits of multiple options and recommend one above the others. Philip is a professor of business administration at the University of Oregon’s Lundquist College of Business. His career includes being a professor of business administration and dean of the College of Business and Economics at California State University, Los Angeles, the former dean of the University of Oregon Business School, and the former Chief Economist for the State of California. The quantitative and presentation skills I developed at Pardee RAND and RAND aided me greatly in framing policy issues, and in explaining my conclusions persuasively-enough to persuade very smart clients (two presidents of the U.S., two governors of California, two governors of Oregon, and a number of Fortune 50 CEOs) and hostile audiences in very partisan political environments. Matt is a Fellow in Cardiovascular Medicine at Stanford School of Medicine. He was previously the principal health economist for the UCLA/VA Center for Outcomes Research and Education. My favorite memories of Pardee RAND are the times I knocked on a researcher's door to ask a simple question and ended up sitting in his or her office for an hour. This instant access to RAND's enormously talented research staff is one of Pardee RAND's greatest assets. RAND's collaborative spirit — open doors, casual dress, a flat organization — defuses any timidity a student might feel approaching a renowned researcher or professor. There is little attitude. Instead, everyone seems to share in RAND's mission: to help make the world a better place. It sounds corny, but it's true. The School's other great asset is its high-quality student body. My colleagues boast a dazzling array of degrees, distinctions, and professional experiences; all were razor sharp. Being surrounded by such extraordinary people is what makes Pardee RAND a rewarding and rich experience. Connor is an economist at the World Bank in Washington, D.C.
Where is the connection between the understanding of theories and methodologies, and the solution to real-world problems? This was my main question to which typical Ph.D. programs did not offer a satisfactory answer. I came to Pardee RAND because I believe that understanding and using sophisticated tools can, if it is done right, be the means towards achieving ends that actually matter. Serious analysis need not be detached from the messy real world in which we live, and because I care about both, this program was right for me. What I learned and did at Pardee RAND and RAND, while technically quite advanced, has remained policy relevant throughout. My own work had more impact for more people than I ever thought possible in a Ph.D. program. Brooke is a conflict management and mitigation specialist for the United States Agency for International Development. Although I'm originally from Montana, I came to Pardee RAND from Paris, France, where I was doing a masters degree in international development and conflict resolution. My background is largely in international development — HIV/AIDS, microfinance, and post-conflict reconstruction. 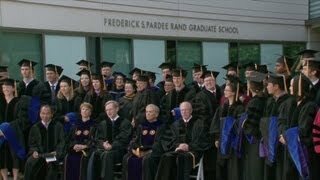 What appealed to me and made me decide to come to Pardee RAND was that it was an advanced degree with a very applied focus. Not only would I learn policy analysis tools in my courses, but applied, practical experience was an integral part of the entire program. 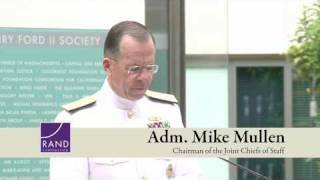 Substantively, I focused primarily on Africa, the intersection of development and security (including civil counterinsurgency, post-conflict reconstruction, failed states and security-sector reform), and HIV/AIDS. Although I did some cost analysis and social network analysis, my work was primarily qualitative. This is partly due to the types of research questions I was interested in and partly due to my comparative advantage. My dissertation work was a culmination of the OJT projects I worked on and sought to answer the question of how to best do development and reconstruction in hostile conditions. Andrea is an associate professor in the Department of Community Studies of the University of California at Santa Cruz. We who attend Pardee RAND are proverbially diverse. But we also have something in common: We are interested in change. We care about the real world, grappling with ideas in order to use them. We value explicitness; only if we are clear about what we have done, and why, can others evaluate the work. We turn out to be profoundly hopeful; we believe that, despite the difficulties, the task is worthwhile. And we like a challenge. Daochi moved from a first job at the World Bank to the China Securities Regulatory Commission (CSRC), the Chinese counterpart of the Security and Exchange Commission. I am in charge of corporate governance, information disclosure, and enforcement of all the 1,200 listed companies in China. The most important thing that I learned at Pardee RAND is the multidisciplinary approach to tackle complicated and difficult policy issues which can be applied in various policy environments. ... As a regulator of the largest emerging securities market, I am dealing with difficult legal, accounting, and policy issues every day that may never occur in any other countries or markets. Fortunately, what I learned from RAND and from Pardee RAND equipped me with the tools to tackle these challenging policy issues. Pardee RAND provided me with both a strategic way of thinking and planning, and practical means for implementation. Thanks to Pardee RAND, I can now easily adapt to and be successful in various policy environment and organizations. Jason is an associate professor of pediatrics at Stanford University School of Medicine. When you come to Pardee RAND, you will discover the rigor of MIT and the diversity of Harvard, all without putting up with the Boston weather. In any given day in class, you may find yourself discussing the War on Iraq with a classmate who is a major in the U.S. Army, talking to a professional opera singer about upcoming music events in L.A., and learning about the monetary policy of Argentina from one of its economists. Sitting in one of the world's premier think tanks, never doubt that the researcher next door who only has a 50 square-feet office may become the next Assistant Secretary of Defense ... and you too will impact the world when you leave. Loren is director of international trade at the Government Accountability Office. Pardee RAND students are required to use their initiative. Whether in designing an independent study or finding project work, they make their own way through the program. It is probably more difficult, but there are few limits to what the student can achieve. When I'm looking for examples of excellent policy-analytic research, I turn to RAND. You're sitting on the largest repository of useful work in our field. More than ever before, U.S. leadership will derive from our example: a pluralistic democracy whose growing economy takes everybody to the higher ground. Yet on each aspect — pluralism, democracy, and growing economy — there is clearly a lot of work for all of us. We need to build a better society. RAND graduates fit into that in innumerable ways, from earthquake protection systems to economic theory in socialist countries. I first came to know RAND 40 years ago. Since leaving government once again, I have found myself even more enlightened, as a RAND trustee, about health care, immigration, crime, environment, and energy. RAND Graduate School as a way of educating the next generation of researchers is exceedingly impressive. RAND's value has always been to provide a broad context for decisionmaking. By focusing the power of empirical analysis on the issues, RAND helps those who must decide our nation's priorities understand what's really at stake. A strong RAND gives America an extra edge in the 21st century. The United States must come to see our own diversity as a great strength, certainly not a weakness and indeed really not a problem. Work being done at RAND today is about that. A prerequisite for formulating sound policy is understanding clearly which courses of action are possible and what can be gained or lost as you follow each of them. RAND is singularly able to lay out the options and insure that policymakers are not blind-sided. For this reason alone, RAND is a precious national resource. We all benefit when the hard questions are being weighed, dissected, and ultimately decided by minds grounded in the kind of analytic depth, reason, and commitment that is an essential part of the Pardee RAND Graduate School experience. More than any other such institution, RAND influenced the outcome of the Cold War. Looking toward the coming century's challenges, RAND's brilliance and independence will be more crucial than ever. We Americans are dedicated problem solvers. We tend to believe that for every problem, there must be a solution, if we just put our minds to it. But in fact there is no single right solution to most policy problems. Thus what matters most is that policy makers be given meticulous, objective analyses of alternatives — of what is and is not possible. No one does this better than RAND. Analysis of the kind RAND pioneered is essential to constructive debate about the course of action to be taken on any difficult issue. We have to think in terms of world order, historic evolution, and a more modest role for America, though not a less important one. We have to address problems that will have no final answers but that, through a series of nuances, move us forward. These are exciting challenges. You have the rare opportunity to help shape the new, and almost certainly better, world to come. When Susan and I see how successful the School has been at attracting top talent from around the world, and what a significant part scholarships play in that effort, we feel genuinely enthused about making these gifts. We know we’re making a difference, in the lives of these students, in strengthening the School, and over time in the world at large. RAND is the citadel of policy analysis.